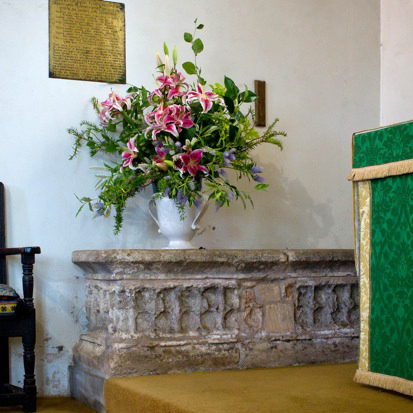 The alter-rails, from an unknown church in South East Devon, are good work of Queen Anne’s period. Note the two niches in the east wall: they probably heard statues of the Blessed Virgin Mary and the Archangel Gabriel, together forming an Annunciation scene. In 1819 they were covered by tables of the Ten Commandments. The leather-work of the reredos (the picture of angels above the alter) was done by Phil Burgess, of West Porlock, in 1900. The altar candlesticks are Flemish.